My name is Meredith Rambo. I am a native Georgian and full time artist. My home is adjacent to historic Kennesaw Mountain National Battlefield Park in Marietta, Georgia. Bedlington Terriers have been a part of my family since 1981. My life is now shared with a delightful Bedlington named Dexter. He is a constant source of inspiration and entertainment. Although working in pastel is currently my main focus, I have painted and sculpted in a variety of media. Animals have always been favorite subjects. I also enjoy doing architectural renderings and portraits of people in pastel. I have also done watercolor “house portraits” as well as pen and ink sketches of houses and historic buildings. I have sculpted “one of a kind” pieces from terra cotta and porcelain clays, soapstone and alabaster. I have also had some of my sculptures cast in bronze. I have studied animal and equestrian sculpture with Eugene Shortridge and portrait and figurative sculpture with Joseph Strother, Umberto Zaffardi and Bruno Lucchesi. After purchasing my first show Bedlington in 1999 and attending a number of dog shows, I became increasingly interested in doing portraits of dogs and other companion animals. I found that pastel was the perfect medium for capturing the texture and gleam of fur, wet noses and sparkling eyes. The fresh, vibrant colors and almost sculptural “hands on” application make the medium especially appealing to me. A very special project for me was painting a pastel portrait of a lovely rescued Bedlington. The image was printed on note cards by the Bedlington Terrier Club of America Rescue. The cards are being sold to raise funds for medical care and re-homing of Bedlingtons in need. Some of my favorite commissions are the portraits I’ve done for Joanne Woodward and Paul Newman and their daughters. One of the portraits is pictured below. 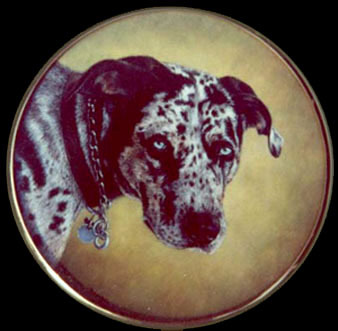 It is of “Griggs”, Paul Newman’s Catahoula Leopard Dog. I have a great interest in fine art in miniature. My miniatures have been included in exhibitions of the Royal Miniature Society in London, England. One of my pastel miniatures was exhibited at the 2004 World Federation of Miniaturists Exhibition at the Smithsonian Institution in Washington, D.C.. I am a signature member of the Miniature Artists of America. I have studied classical miniature painting with British artists, Joan Cornish Willies of the Royal Miniature Society and Elisabeth Davys Wood, founder of the Society of Limners. and should not be used without permission of the artist.